Sam Quinones’ “Dreamland” documents how the prescription opiate epidemic in America intersected with the heroin scourge. The book made several publications’ Year’s Best Books lists, including ours. Every so often I read a work of narrative nonfiction that makes me want to get up and preach: Read this true story! 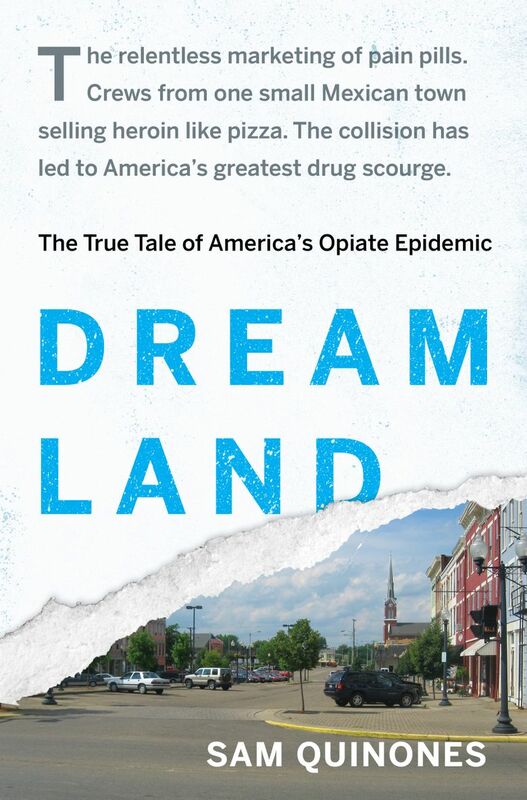 Such is Sam Quinones’ astonishing work of reporting and writing, “Dreamland: the True Tale of America’s Opiate Epidemic” (Bloomsbury Press, $28). “Dreamland” documents how the prescription-opiate epidemic in America intersected with the heroin scourge, as a crackdown on prescription opiates turned people addicted to Vicodin, OxyContin and other opiates toward cheap Mexican heroin. It’s a story of the American Midwest, where proud manufacturing centers in All-American states like Ohio turned into centers for “pill mills,” clinics where corrupt doctors prescribed Vicodin and OxyContin in bulk quantities. Desperate drug seekers looted Wal-Mart to pay for their habit, and an entire economy ran on the buying and selling of illegal prescription drugs. It’s about the small Mexican town of Xalisco in the state of Nayarit, which became an international center for the trafficking of heroin involving a vast network of towns and cities on both sides of the Mississippi River. Dealers from Xalisco (the village, not the Mexican state of Jalisco) spread heroin to America’s wealthier suburbs, where kids raised in affluence could easily procure and pay for ever-cheaper heroin. One of “Dreamland’s” strengths is its portrayal of life in Xalisco (to research one of his earlier books, Quinones moved to Mexico and became fluent in Spanish). The heroin dealers of Xalisco fanned out all over America, from Portland to Tennessee, adopting a “home-delivery” model for heroin that spared users the danger of hitting the streets for drugs. Some used suburban parking lots for transactions. Some helpfully supplied free heroin to users thinking about quitting. They never used the drugs themselves. Then a crackdown on prescription opiates created a new surge of customers for their cheap black-tar heroin. Maybe you’re thinking: Well, that’s interesting, but what has this to do with Washington state? There are some local heroes in this story, including University of Washington Pain Center founder John Bonica. He pioneered a holistic approach to pain treatment, the opposite of the prescribe-a-pill approach. Researchers in the state’s Labor and Industries Department were among the first to discover a rise in deaths caused by prescription opiates. • Drug deaths involving opiates (both heroin and prescription) increased 31 percent statewide, from 2002-2005 to 2011-2013. • Researchers comparing data on publicly funded drug treatment for opiate abuse during the same period found that admissions increased 197 percent. • In King County, fatal heroin overdoses surged by 58 percent in 2014, up to 156 from 99 the year before. Caleb Banta-Green, an affiliate associate professor of health services at the UW School of Health, has read Quinones’ book. He confirmed that cheap black-tar heroin from Mexico is the culprit in rising rates of heroin addiction in Washington. “Dreamland” will be out in paperback in April. Think it doesn’t affect you? Check out the scene on Seattle’s Third Avenue, where any bus rider can see drug deals going down. Think of the stories you’ve heard of prescription-opiate addiction among bright young people with everything going for them. Think again — for better or worse, “Dreamland” is a true American story. Mary Ann Gwinn: 206-464-2357 or mgwinn@seattletimes.com. Gwinn appears every Tuesday on TVW's "Well Read," discussing books with host Terry Tazioli (go to wellread.org/the-tv-show/show-archive/for archived episodes). On Twitter @gwinnma.